Oh, those summer nights — biking, swimming, roasting marshmallows — oh, and at Saint Rose of Lima Parish in Haddon Heights, reading and writing, too. 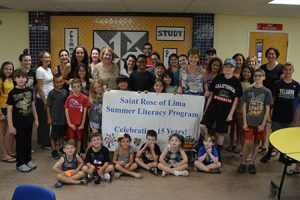 This fun, free summer program was created by Dr. Bernadette Janis, a long-time parishioner at Saint Rose of Lima, professor at The University of Pennsylvania Graduate School of Education, and mother of six children, all of whom attended Saint Rose of Lima School from K-8. 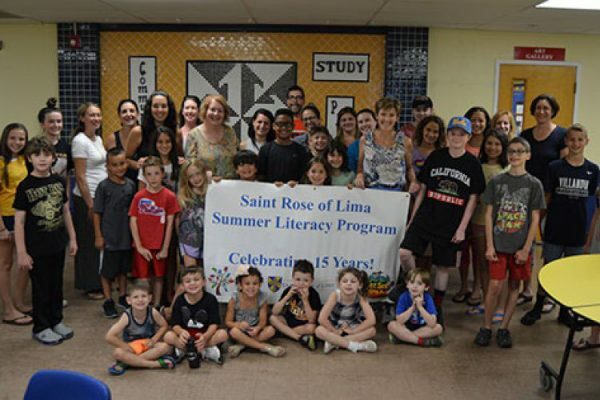 Dr. Bernadette Janis, teachers, and K-8 students from Saint Rose of Lima’s Summer Literacy Program celebrate another fun summer in Haddon Heights. For 15 years, the program has taught reading and writing to the youth every Tuesday. Free and open to friends and family of Saint Rose students and parishioners, the heart of the program are the volunteer teachers, mostly parents of the participants. The teachers are trained by Dr. Janis, who creates lesson plans and gathers resources. Kids and teachers alike look forward to coming back summer after summer to partake in the fun. Matthew Janis is a graduate of Saint Rose of Lima School, Haddon Heights, and Paul VI High School, Haddonfield. A senior at Temple University, he is the son of Dr. Bernadette Janis.